Well it’s that time of year again. Just when I thought the Canadian government were going to abandon the seal hunt I receive an e-mail asking me to sign a petition to get the Canadian government to ban their annual seal slaughter. It is tragic and so sad of course for the poor animals who will be shot, have their skulls bashed in or even skinned alive. It is pathetic that the Canadian government continue with this senseless slaughter as there is no market for the pelts as the US, the European Union, Taiwan, Mexico and Russia have now all banned seal-fur imports. Please take action by writing to Canadian Prime Minister Stephen Harper and demand that he bring the massacre to an immediate end. There is a template, please edit and personalise if you can, but if for some reason you are not able to do so than do send it as it is. Please be polite. I know how much you may want to tell him in no uncertain terms what you think about this shocking cruelty, but abusive letters are unlikely to be read. Yet another entry concerning the welfare reforms here in the UK. I regret that so far my blog, which is intended to focus on worldwide issues, has mostly concentrated on the struggle we are having here in the UK to preserve our welfare and health care systems which were once the envy of the world. Here is a little background information for anyone not familiar with the situation here in the UK. The right wing Tory government along with their supposedly middle of the road coalition partners the Liberal Democrats have waged war on the poor, sick and disabled, the low paid and the unemployed. This the government for the rich led by the rich are slowly eroding our welfare system, our universal free care health system the NHS and the social progress of common morality and decency, the mark of any socially progressive civilisation. Unless people make a stand the progress of the last sixty years will be gone and we will return to a time which most of us had thought had been forever consigned to history. There are two actions below you can take to stop one of these vicious and unfair welfare reforms, namely, the Bedroom Tax. The bedroom tax effects anyone living in social housing but will be of particular detriment to the disabled, including those with mental health conditions, single parents, families of those recently deceased and anyone on low pay or unemployed. Please consider attending a peaceful demonstration near you on Saturday March 30th This time there are 50 venues up and down the country. Again solidarity is the key so please please please even if you are not personally affected by this shocking reform support the protest. My husband son and I attended our local protest on Saturday even though this particular reform does not effect us. Unless you are rich most people have had their lives marred in one way or another by Tory austerity measures . Enough is enough, time to stand together and support one another. Here is another way those of us who are required to pay bedroom tax can make a stand and consign this particularly spiteful vicious cruel inhumane reform to the garbage bin of unfair welfare polices that is literally killing UK citizens. 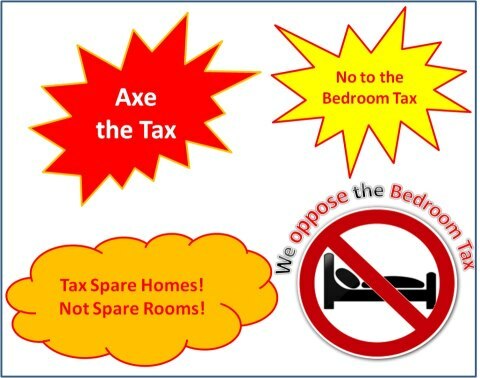 For an excellent blueprint for destroying the Bedroom Tax please click the following link from the Blog, Diary of a benefit Scrounger and take action. All that is required is about ten minutes of your time to read the instructions and the writing of two letters to the council. Also included in the information below is a template letter. This is a very effective method of destroying the bedroom tax so please read carefully and take action. DWP estimate 200,000 people will lose their homes from this policy. 440,000 of those affected have disabilities. We cannot allow this to happen. “Time is of the essence given how imminently the bedroom tax will be imposed“. Please share share share with everyone by social networking and by simple word of mouth. Sitting in parliament involves hours of listening to opinions with which you profoundly disagree. I am usually able to do this without shouting, but as soon as I hear Labour members calling for hunting to be banned, I completely lose it. These remarks were made by then MP, now unfortunately Prime Minister, David Cameron in the Guardian Newspaper. What does David Cameron’s treatment of animals and his remarks above say about his heart? What do these comments say about his state of mind? Yes indeed we are. I firmly believe that if we cannot love or feel compassion for an animal we are less likely to feel compassion for a human being, or put in reverse we cannot experience the full meaning of what it is to be compassionate if we harm another animal without remorse or even worse for pleasure. Besides the unacceptable remarks regarding Tourett’s syndrome, which seems to be a popular but offensive comparison Cameron has made before and continues to make, his sickening enthusiasm for hunting a defenceless animal after pursuing him with a pack of hounds is nothing short of disturbing, not only because of the barbaric cruelty involved but because of his zealous even obsessive determination to pursue the matter of preventing a ban on hunting with hounds. Also the devious manipulative tactical ideas which he has to stop the ban are also disquieting, particularly in light of his dogged determination and manipulations to push through draconian welfare reforms by any means possible. Reforms that have left many sick and disabled people in poverty, forced many into homelessness and compelled others to an American like workfare scheme of forced slave labour as unemployed young people and the sick and disabled, including the terminally ill, are coerced into a work experience programme for no pay. His obsessive drive to implement these reforms has indeed many similarities to his determination to stop the hunting with hounds ban. Tory MP David Cameron sees red during this week’s hunting debate and looks forward to a fierce battle against the introduction of a ban. Besides the unease that his rhetoric above has in light of the vicious and callous welfare reforms and controversial privatisation of the National Health Service, the whole thing is a sickening insight into the mind of a person who gets pleasure from hurting an animal. His enthusiasm for doing so is scary and boarders on psychotic. Many dangerous Sociopaths have an history of animal cruelty. No – I am not suggesting that Cameron is a dangerous sociopath of the ‘serial killer’ variety, this is a popular misconception as the vast majority of sociopaths are not. Social factors including parenting determines if a sociopath becomes the stereotypical serial killer or other criminal, or a politician, a lawyer, a doctor, even a psychiatrist. However upbringing and social considerations determine only the expression the condition will take and will have no effect on the person’s lack of empathy or conscience. If you are not familiar with what is happening here in the UK with regards to the welfare reforms and the disastrous effect this is having on people who are too ill to work, please visit the websites listed at the end of this entry. Our humanity isn’t measured by how we treat other people…Our humanity is measured by how we treat animals. Think about it, what is the difference between hunting a fox with a pack of hounds and hunting your neighbour’s cat in a similar manner. Too shocking to even contemplate. If this happened to some ones cat or dog there would be a public outrage, the RSPCA would prosecute and the perpetrator would be labelled a sadistic monster, a sociopath and be publically vilified, heavily fined, even spend some time in jail, he would not be elected to parliament and most certainly would not be elected as Prime Minister. His sick and sadistic behaviour would automatically exempt him from such a position. Yet because Cameron’s enthusiasm for fox hunting is not seen in quite the same way, at least not according to the law, no such vilification is forthcoming at least not officially nor by the general population who either do not know of his fondness for the so called sport or have forgotten. Yet are not the two scenarios the same, a fox or a cat what is the difference the hunting of any animal for pleasure is sadistic, disturbing. Though of course concerning fox hunting this time he did not get his own way and fox hunting has rightly been outlawed. Though as soon as Cameron was elected he did try to reinstate hunting with hounds and continues with this pursuit, however this practice continues to be banned – at least for now. I vehemently oppose both the evils of hunting and the equal evils of most of Cameron’s and the Tory government’s policies, most particularly the barbaric welfare reforms and the privatisation of the NHS and in general his support of the tiny minority in our society who exploit the earth, animals and other humans – the rich. 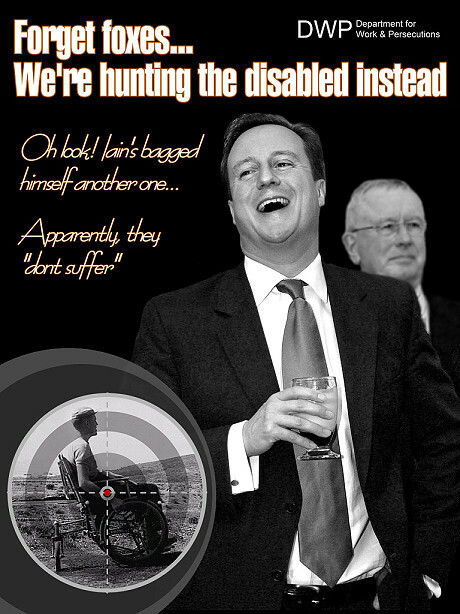 Is Cameron a sociopath? Who knows. He destroys people’s lives without remorse, with a relentless determination and with manipulation. One thing for sure he has an obsessive and sadistic pleasure for hunting defenceless and harmless animals, this in itself speaks volumes. Gerry Steinberg MP (Labour) points out that the cruelty extends to the hounds. “It sickens me to say that puppies that do not show aptitude for hunting, or whose colouring or body shape does not meet the requirements, are usually shot by the kennelman. Foxhounds fortunate enough to make the grade as puppies are trained to chase and kill foxes during the cub-hunting season. It is a particularly unpleasant aspect of hunting that involves the chasing and killing of fox cubs for the purpose of teaching young hounds to kill. “Killing for pleasure is wrong and should be banned. Fox hunting, stag hunting and hare coursing are moral issues. It is time that we stood up for morality. The commandment Thou shall not kill may be hedged with exceptions. Thou shall not kill for pleasure is not; it is a commandment for the 21st century and it is time that we respected it unambiguously, without prevarication and without procrastination. The broken of Britain thebrokenofbritain. Freud has angered many people including myself over numerous issues concerning welfare reform including the bedroom tax. Perhaps you remember when he responded to a call from a separated parent about this unjust reform. In response to a call on the BBC Radio 5 Live caller programme he told separated father of three that he did not deserve a spare bedroom as his children only stay with him at the weekends and holidays and on such occasions they should sleep on a sofa bed. I would like to ask him why he thinks that he has the right to a spare room and others do not? He told another caller on the same radio show to take in a lodger. Well Freud why don’t you take in a lodger? It would be good to give a home to someone in need, someone made destitute by your vicious welfare reforms. Perhaps he thinks he has worked for the right to have at least twelve spare rooms, if this is the case and his wealth is not inherited than so have most people and those who have not it is most likely no fault of their own either as a result of disability, chronic sickness or unemployment. Maybe they have earned poor wages and never been able to afford a home of their own. Most people work for low pay, barely managing to pay their bills. My husband worked for twenty-five years, sixty hours a week before being made redundant. Yet despite the long hours we had little money for luxuries; it was and still is a struggle just to pay the bills. We have only had central heating in the last decade, now we can barely afford to use it. Unlike Freud, Cameron and the rich they support we cannot have our heating on all night and during the day we have to keep the temperature low. The sudden and bitterly cold snap this January is a nightmare for many people and I wonder how many will lose their lives too afraid to turn on the heating because of the extortionate cost of energy. By the time we have paid our bills we have little left for clothing, replacement of crockery, bedding etc and the means of maintaining our home, let alone luxuries. A holiday? Extremely unlikely. I dread to think what will happen if some major repair is needed. And I mean vital repair, for our home is in need of repair, for instance damp proofing. Every room in our house is riddled with damp I mean serious black unhealthy mold. Why do some people think they have the right to possess more than other people, the right to far more than one or two spare rooms, a spare house even. The right to get up in the morning to a warm home while others die of cold. The right to luxuries, holidays and so on. The right to accrue wealth they do not need usually at the expense of other people or for work they have not done, either as an inheritance or the interest accrued on the huge amounts of money they have acquired usually by exploiting others. I ask you Freud why should you not make some sacrifice for the sake of the so-called financial crisis? Why do you feel you should be exempt? Why does Cameron and the other blood sucking parasites who live off the labour of other people not think they should make a sacrifice, like the president of Uruguay who has taken a huge 80 percent cut in wages or the French president and his ministers who have taken a thirty percent wage cut. How dare you ask the exploited of this country, the low paid, the sick and disabled to bear the brunt of the so-called financial crisis, which they were not responsible for? How dare you expect others to live in deprivation, to sacrifice the small luxuries in life which really aren’t luxuries are they? I mean a spare room for god’s sake. Penalizing people by reducing their housing benefit because of one spare room which in most cases is nothing more than a spare cupboard. I bet these politicians have wardrobes bigger than most people’s spare rooms. Do you bloody well mind if we have an extra room to sleep a visitor or family member or a place to practice a hobby or just simply a bit of space to live. Please attend the nationwide demo against the bedroom tax. This is a peaceful rally to protest against this outrageously unfair welfare reform which will leave many people already struggling with the devastating affects of the Con/Dems vicious reforms even more impoverished. 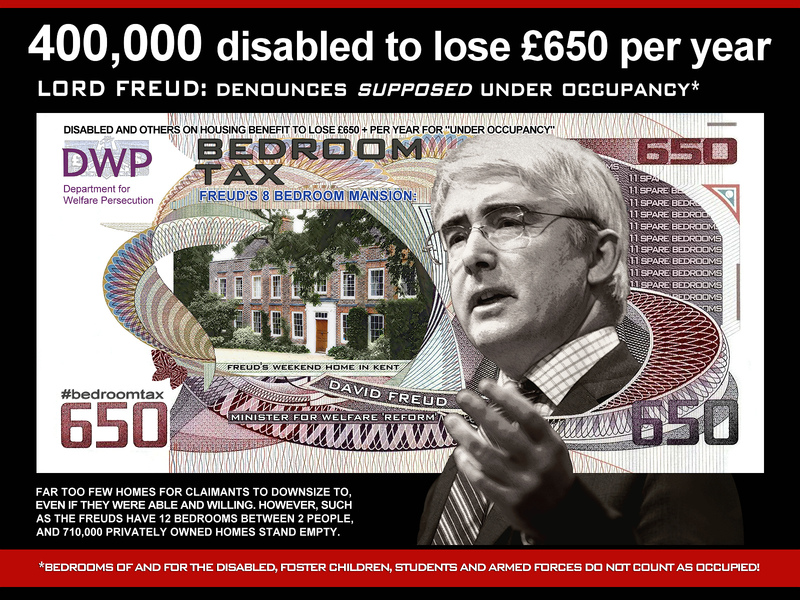 The excellent political artwork below and commentary by flick user Byzantine_k clearly conveys the hypocrisy of Freud’s ill-conceived Bedroom tax. “David Freud, millionaire and former banker, began his current role under Labour, but ‘jumped ship’ to the Conservatives on the eve of their taking control of the government in 2010, and so it seems, to pursue a more vigorous and hostile attack on welfare and the claimants of such. 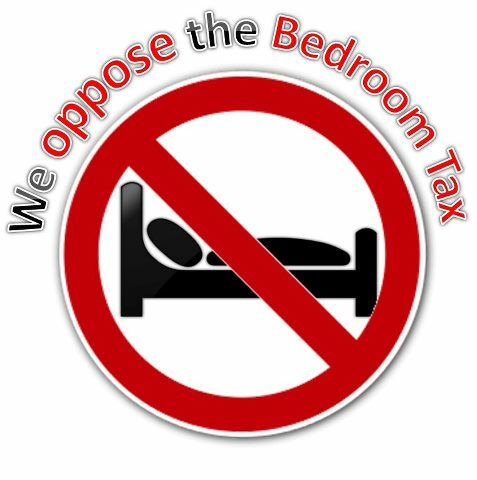 Freud’s so called bedroom tax is a cut being applied to the housing benefit of anyone in social housing perceived to have spare bedrooms -irrespective of whether these bedrooms are actually spare or not. The more supposedly spare bedrooms, the more money is taken. 100,000s of households stand to lose at least £650 per year, which on top of the existing cuts and rises to the cost of living; will be nothing short of a disaster. People will be reduced to poverty, and some to homelessness as a direct result of this ruthless and disgusting cut. Under the bedroom tax rules; children of either gender must share a room if both are under 10. Children under 16 if both are of the same gender are expected to share a room. Considerations of privacy and personal space mean nothing to this government – at least when it concerns the poor. Even parents of disabled children are being told that their child is not allowed their own room under these rules! No consideration for the needs of those with physical disabilities, who may have to have specialised equipment, none for such as autistic children who again may need specially adapted rooms. And no consideration for the siblings expected to share a room with them. Rooms adapted to suit other needs, such as containing medical equipment that there is no space for in the primary bedroom? No, sorry, according to Freud it’s a ‘spare room’. A therapeutic space for your disabled child? No again. If you have a foster child, his or her room is now regarded as ‘spare’, as are the rooms of offspring away at University, or serving in the armed forces. Indeed, the country that you are allegedly fighting for, is no longer prepared to cover the costs of your bedroom in your family home. As for university students, the rising costs of higher education are drifting above the grasp of poorer families anyway. You must take the cut or downsize insists the government. But many can do or afford neither. Besides this, there is a vast shortfall of available accommodation to downsize to. There is simply nowhere for most to go even if they were willing and able to, none of which seems to have occurred to, or to bother those behind this miserable scheme. And the sheer rank hypocrisy of David Freud and the numerous other wealthy members of this government, people who claim thousands of pounds in expenses every year whilst receiving substantial salaries, other income and owning 2 or more properties. Freud owns an historic eight bedroom mansion in Kent (and that’s not considering the numerous other ‘spare rooms’ that such houses contain) and which comes with outlying cottages, and a four bedroom town house in London. That’s twelve bedrooms between two people. The poor things must be so cramped! And that’s just what we know of. Iain Duncan Smith, the Secretary of State at the Department for Work and Pensions, and Freud’s boss, deserves singling out for his hypocrisy as well. A millionaire too, his own country ‘retreat’ is a£2 Million Tudor manor house with landscaped gardens, a tennis court and swimming pool – none of which he even has to pay for, coming via the family of his even wealthier wife. It is true that change can be brought about by the actions of a small group of people. So today if you live here in the UK or are a citizen of the UK I am going to ask you to help with a campaign which will involve as great a number of concerned citizens as possible. The action concerns yet another welfare reform, Employment and Support allowance (ESA), that replaced Incapacity benefit, and the unfair work Capability Assessment (WCA). Enough is enough we must act now! The Tories have always been opposed to decent levels of pay for working people, state education, universal healthcare and benefits, including pensions. However this present government including their partners in crime the LibDems have excelled in this perverted right wing mentality. In the last two years they have done their utmost to set the clock back decades. I believe in time they will destroy our welfare system entirely along with the NHS and free medical care. They have used the excuse of global recession to justify this vicious attack on everything that once marked us as a civilised nation. The warped mentality behind such endeavours is beyond the comprehension of most people with any kind of basic ethical code of common decency. As a result of benefit reforms thousands of seriously ill people have been found fit to work and have had their benefits cut off. In one sad case in East Grinstead Sussex a terminally ill man who needed treatment for kidney failure 5 days a week starved to death after having his benefits stopped after being told he was fit to work. Read more of this shocking tragedy, one of many examples of the devastating effects of the government’s draconian welfare reforms. Solidarity is the key to thwarting the coalition’s onslaught of so called austerity measures not only on benefit precipitants but on the vast majority of citizens except the rich. Please start by reading the information below from the Blog The Diary of a Benefit Scrounger and by clicking the links that follow. Please take part in this action even if you are not sick, disabled or a carer. “In a few weeks, I’m going to arrange for some very significant stories to break in the very mainstream press about ESA. I’ve been collecting them for about 6 months and if there’s any justice left at all, they will kill ESA once and for all. We need a Spartacus 2 and as you all know, I’ve been sick as a dog. You don’t have to be claiming ESA or even sick or disabled or a carer. This is a mutual shame, a shared disgrace. We must ALL show politicians of all parties, the public are NOT OK with this. There will be a task most days, so please keep watching my blog. It seems that these days it is one outrage after another as this unelected government continues its so-called austerity measures and deliberate destruction of our welfare system. Among the ever increasing tallies of social injustices perpetrated against the poor, the disabled, the unemployed and the low paid is the bedroom tax. Housing Benefit ‘bedroom tax’ for social housing tenants will be introduced in April this year. What will happen is that under the new rules Housing Benefit will be reduced for working age people who have an extra bedroom. This will affect council housing and housing association tenets (social housing) with a spare bedroom who will lose 14 per cent of their housing benefit, or 25 per cent if they have two spare rooms. The Bedroom Tax penalises the disabled, single parents, families of those recently deceased, foster parents and the parents of children in the army or at university. What makes this an even greater injustice is the shortage of one bedroom council homes. Spread the word via the usual social media. Even if this does not affect you please support this protest. Solidarity is the key to defeating this evil government, we must support one another against the onslaught of these vicious welfare reforms whether we are fit and able or sick and disabled, employed or unemployed, well paid or low paid, retired or working age, have our own home or live in social housing. The government has detrimentally affected the wellbeing of the vast majority of people in this country except for the rich, it is time to say enough is enough and band together in unity. My family and I are not affected by this particular vicious and unjust reform but despite ill-health I, along with my husband and son, will do my damnest to join the protest. The Tories have persistently adopted the age-old tactic of divide and conquer in order to cause disunity and resentment, such as the employed, particularly the low paid, against benefit claimants whom the government have ladled as “scroungers” living off tax payers money. The reality is we are, “all in it together” as the injustice of low pay is as great an injustice as the vicious unfair welfare reforms. It is in the interests of the Tory’s for us to oppose each other with talk of “strivers versus skivers”, the truth of the matter is the Tories are robbing the poor to make the rich more rich. Keep in mind that in April while thousands feel the pinch of the bedroom tax the Tories will give 13,000 people earning over £1 million an average tax cut of £100,000. Also interestingly Britain has 284,317 millionaires who are collectively worth £1.28 trillion, not including their main residences. Wow!!!! that could pay for the so-called National debt, so why have the rest of us got to face these unfair austerity measures including these draconian welfare reforms such as the bedroom tax? Until we can get past this type of thinking there will never be a fair world were every man woman and child has enough to eat, adequate housing, warmth, clothing and quality of life. Whether self-made, lottery winners, or inheritance recipients no one has the right to such wealth while others struggle to get by or worse live in poverty. And don’t forget many successful businesses have become successful as a result of the exploitation of other people, such as the low paid both here in the UK and abroad; many business people have made their money by sending manufacturing to such places as China and elsewhere where wages are low which not only exploits already impoverished people but also results in unemployment in the UK. In simple terms this is not fair – the bedroom tax is a grave social injustice. Why do the Tories need more bedrooms than you? Why is it that some people consider one rule for you and I and another for themselves? house-bound disabled person who needs extra living space. Frankly everyone should be entitled to at least one spare room, a place for privacy and leisure pursuits. The injustice of this criminal tax is further accentuated when there are 710,000 empty homes in the UK. “The shadow housing minister, Jack Dromey, said the rise was “inevitable”. Information of interest gleaned from various sources involved in the protest. 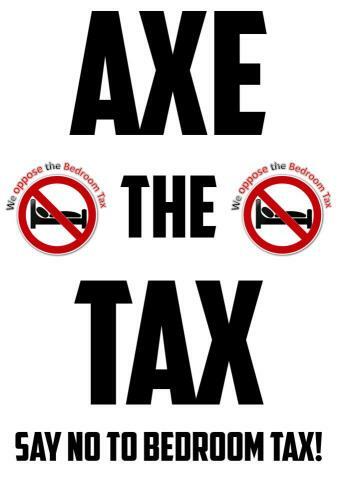 “OK PEEPS LISTEN UP ( BEDROOM TAX ) IF YOUR SMALL BEDROOM IS 70SQ FT OR UNDER IT IS CLASSED AS A BOXROOM THERE FOR CAN NOT BE CHARGED BEDROOM TAX , THIS IS LISTED UNDER THE HOUSING ACT 1985 SECTION 326 , PLEASE USE THIS DO NOT TAKE ANY EXCUSES FROM THE COUNCIL AS THE HOUSING ACT 1985 CAN NOT BE CHANGED BY LAW . PLEASE MEASURE YOUR ROOM AND PUT YA FOOT DOWN AS THEY HAVEN’T A LEG TO STAND ON , I PUT THIS TO THEM TODAY AND I AM RIGHT , ( 63sq ft is 9ft x 7ft )” ……………….